Though Seattle is still a young city, growing and changing, much of its short past is already lost-but not forgotten. Generations of Seattleites have fond memories of restaurants, local television shows, stores, and other landmarks that evoke a less sophisticated, more informal city. This new book explores Seattle at a time when timber and fish were more lucrative than airplanes and computers, when the city was a place of kitschy architecture and homespun humor and was full of boundless hope for a brighter future. These rare and vintage images hearken back to the marvels of the 1962 World's Fair, shopping trips to Frederick & Nelson and I. Magnin, dinners at Rosellini's, dancing at the Trianon Ballroom, traveling on the ferry Kalakala, rooting for baseball's Rainiers, and local personalities including Stan Boreson, J. P. Patches, and Wunda Wunda. Author Clark Humphrey is the editor of the Belltown Messenger, a book reviewer for the Seattle Times, a former staff writer with The Stranger and The Comics Journal, and an acknowledged local expert on retro Seattle. 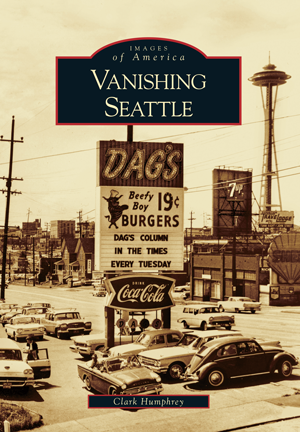 Within these pages, he showcases more than 200 images of vanishing Seattle icons gathered from such institutions as the Museum of History and Industry, the University of Washington, and the Seattle Municipal Archives, as well as from various private individuals including the collection of Mary Randlett and the author's own collection.